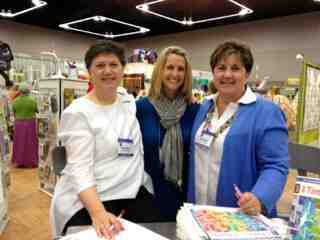 One of the best benefits of quilt market.....meeting people!! Like-minded, kind and inspirational people is just a small compliment to the group I met. 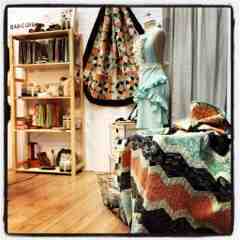 There were designers, authors, pattern makers and those who represent and promote their work. 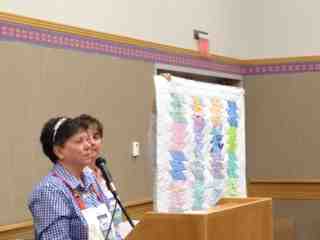 I met so many awesome quilters from around the world including some amazing authors. I was able to have few books below autographed. 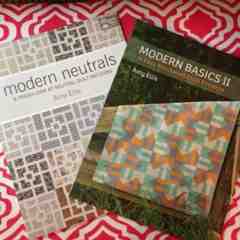 It is such an honor to have these in my library. I finally got a chance to meet the lovely Bari J of Art Gallery. I have been following her on social media but a great pleasure it was to meet her in person! 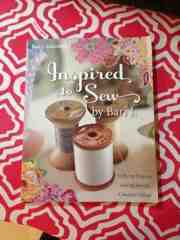 In addition to the 1/2 yard bundle of fabric I picked up I also got her book "Inspired to Sew" There are so many cool project in this book. It think there might have to be a quilt-a-long in the near future!! 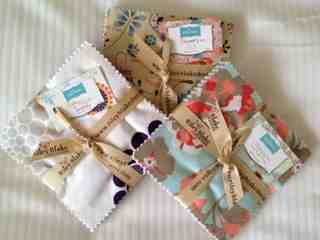 Me & my sister designs who are responsible for bring us Amelia, shades of black and coming in October, Giggle. Here I am with them and was excited for my book called "Twice the Charm"
A fairly new pre-cut by Moda that features 20 5" x 44" strips is called a dessert roll. 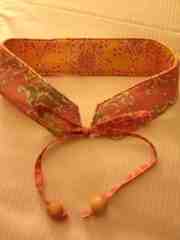 Equally as cute as a jelly roll and of course tied with a bow. 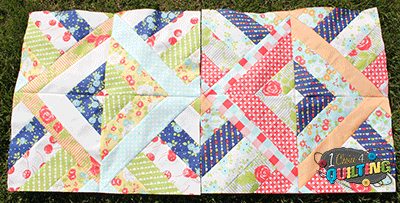 Here is a dessert roll by Kate Spain featuring the In from the Cold collection. Available now. 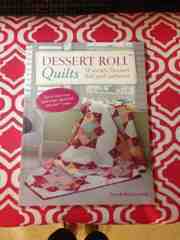 I was lucky enough to pick up a book on Dessert Rolls. 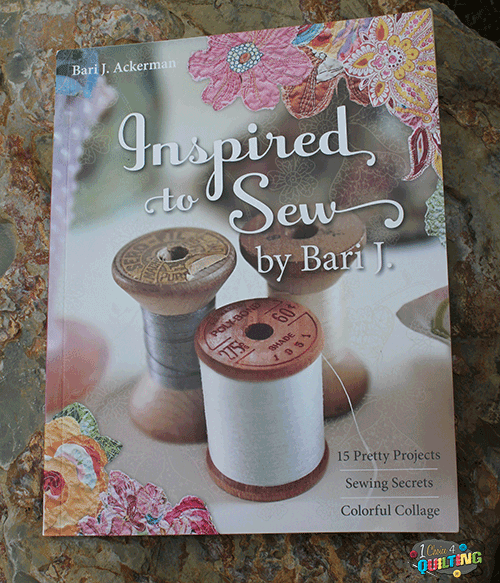 Now the reason the book is so great is because it not only feature quilting but also includes my other favorite hobby....cooking!!! 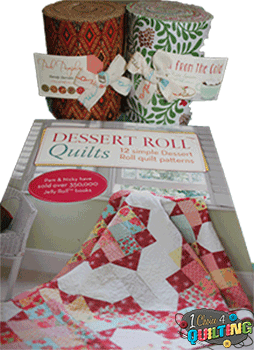 Dessert Roll Quilts by Pam and Nicky Lintott includes 12 dessert roll quilt patterns as well as 12 recipes. What fun! Another awesome perk....free reading material. Could not beat stopping at the Magazine Publishing Booth! This is always a wonderful way to sample a magazine before choosing to purchase a subscription. 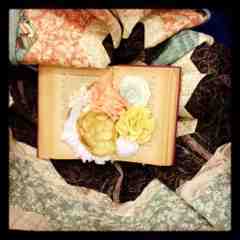 In addition to the books I picked up some fabric samples and participated in some make & takes. 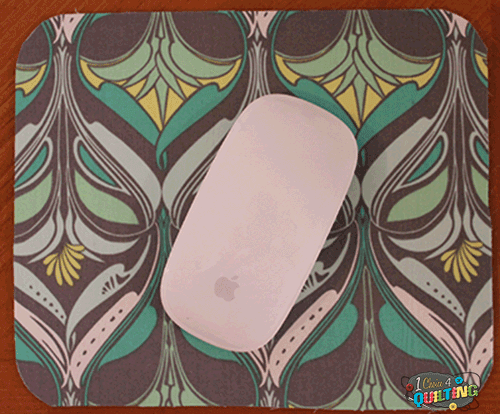 Here I made a fun Art Gallery inspired mouse pad sponsored by Pellon! Now that was cool and very needed! It's already found a lovely new home. I will not soon forget all of the wonderful people I had the chance to meet and share coffee, lunches, dinners, laughs and a huge love of fabric, quilting and all things creative!! You were all an inspiration!! 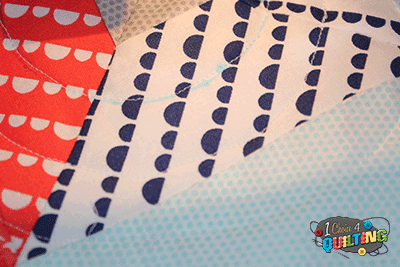 As mentioned this week is optional but I am posting with a cool quilting tip! Now grab a round object. 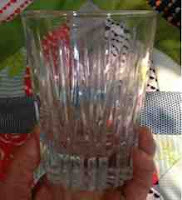 This could be a bowl, a glass or any other round topped household object. You'll also need a washable or disappearing fabric marker. I use a Sewline Washable Marker. 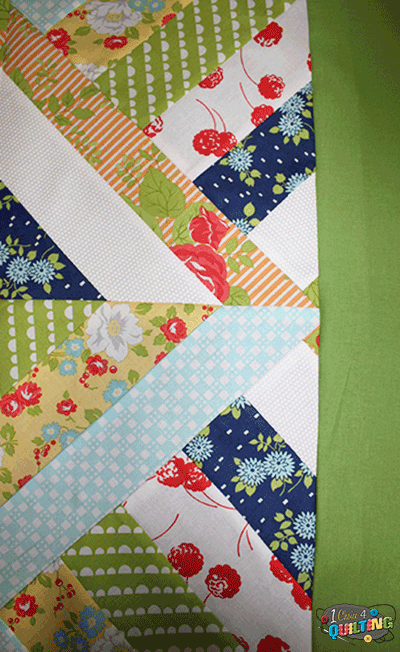 Now place your round object in the center of your square or anywhere on your quilt if you really want some variation. 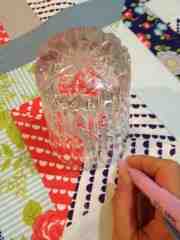 Trace around your round object with your marker. Move to your sewing machine and stitch over you tracing. 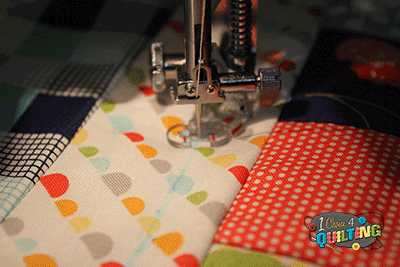 Move out about the width of your standard sewing machine foot or so and use your first circle as a guide. You can go as close or as far as you'd like. I went about an inch apart. The fun thing about this method is you can trace circles all over, overlap them or scatter them or sew the sequentially as I have here. Use round objects of varying sizes and go to it! Again my goal is to provide you with tips you can use again and switch them up for variety. I can't see what you come up with. 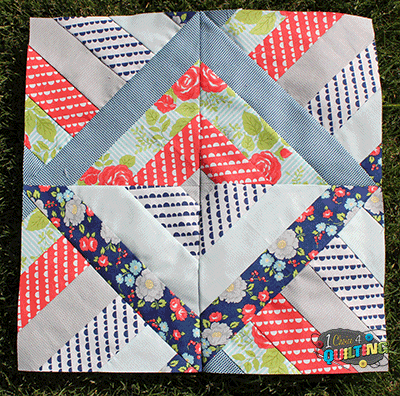 Don't forget to post your quilt top photos to the Flickr group page by Memorial Day for a chance to win a red, white and blue fat quarter bundle!!! Also if you love photos, start following 1choice4quilting on Instagram!! So quilt market has been absolutely amazing. I've been walking the exhibits and taking in all the beauty. There are so many different booths all done so creatively and just gorgeous. 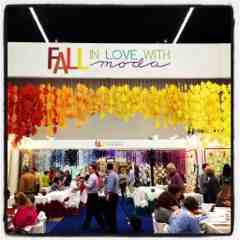 Below is the moda booth. They were all decked out for Fall showing all the new fabric releases that will come in September, October and November. 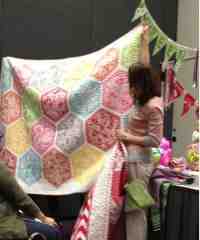 Moda #quiltmarket Booth. They won 2nd place for Booth Design! Although this was not a make and take, Lila was using this adorable pin cushion and thread catcher. The pin cushion was weighted so it was stable on the edge of the table. I am working on a way to link up to that tutoriial. Next it was back to Moda. 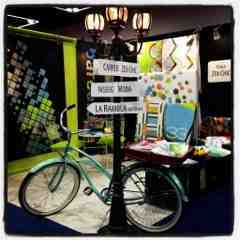 Here is the Zen Chic for Moda Booth. If you loved Comma, Comma wait until you see her new line, Barcelona due out in the fall! Sweetwater is continuing their tradition of printed fabric with Road 15. This fabric tells the story of where "home" was for thousand of Sweetwater fans growing up as Road 15 was their street address for many years. 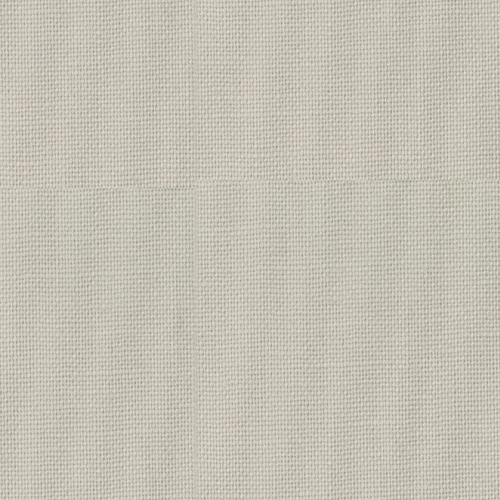 This fabric will be available in August and will be stocked in all pre-cut categories. Next it was on to the BasicGrey booth. Unlike anything I have see in the past, this fabric perfectly combined many pleasing colors so well that they all come together flawlessly in Sweet Serenade. This fabric will be released in August so keep your eyes out for this one! My night ended with the Moda Customer Appreciation event. After a short walk from my hotel to the River, I boarded the Portland Spirit. It was no nice to meet some of the designers and put a real live face to the name and photographs we see. It was also nice to get to know them on a personal level. I learned a little about their families and what truly inspires them. 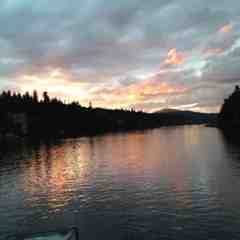 The evening ended with beautiful sunset. All in all the day was another wonderful experience! I choose to do sample spree as a separate blog as it was an event all it's own. As I sat at a restaurant having my dinner, I watched a line form two hours ahead of the doors opening. The line went two ways. One line down the hall, the other down the stairs. It was remarkable to watch. At 8 pm the line started to move and then disappeared. Two folks I had met and had dinner with and I started our journey up the stairs and into the sample spree in the ballroom. Wall to wall people all shopping for the fabric and notions that they could receive in advance. The Moda table was completely packed to the point I couldn't see what was on the table. However I was able to purchase the new lines from Kate Spain called Sunnyside, the new Me & My Sisters Design named Giggles and BasicGrey's new line Sweet Serenade. 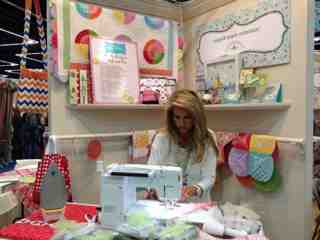 I headed over to the Riley Blake Designs table where I was able to purchase some lovely new fabric lines. I can't wait until the full of these fabrics shown below from left to right called Asbury Heights byDooHikey Designs, Twig and Grace by Sue Daley and Kensington by Emily Taylor Design. I also found several new designers and companies I had never heard of before. 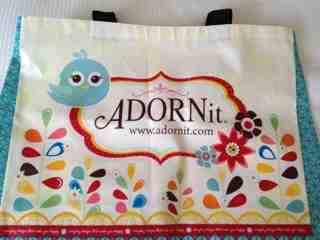 One was a family owned and operated business called Adornit! 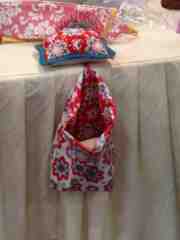 They were giving away these adorable bags so I can't wait to see what there fabric looks like! I will be checking them out more extensively today and will share photos of their fabrics as well as others I discover in Part 3 of the blog. I invite you to follow the blog this week as I traveled from Pennsylvania to Portland, Oregan for the International Quilt Market! I arrived in Portland late last evening and was quite thankful to have gained three hours in my travels. This morning started out well as I embarked on my 1st day at the Spring Market being held this year at the Portland Convention Center. The actual trade show doesn't start until tomorrow. So today I took part in what was called Schoolhouse. 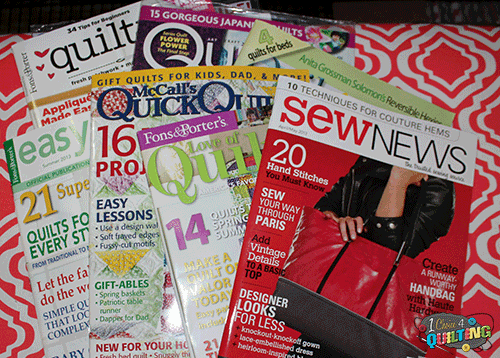 This was a series of short 30 minute presentations on new fabric lines and products, quilting techniques, notions, business tips and many other topics relating to the quilting industry. Some of my first classes were business related so I won't bore you with those details. Instead I will show you all the beautiful product releases from Moda, Riley Blake and others that you have to look forward to over the next half of 2013! 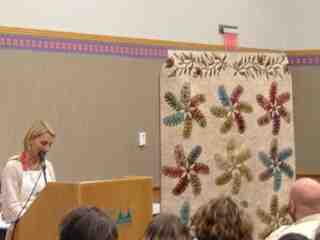 Riley Blake Designs showcased beautiful new fabric lines, exciting patterns and gorgeous quilts. The quilt on the left was made using their Cotton Pop, Shuffles and Solids which are all part of their basics collection. The one on the right is a black, white and red done as a school colors quilt with letters appliqued representing the school name. What a perfect graduation gift. And what perfect timing! 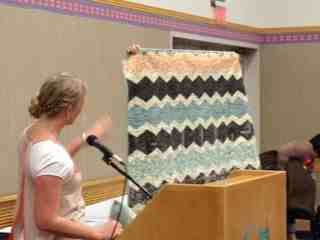 What grad doesn't need a quilt? 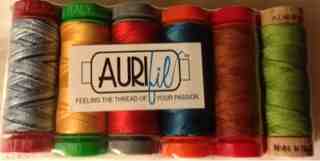 as well as a sampling of thread from AURIfil. 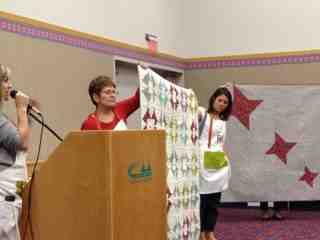 Towards the end of the day I participated in Moda's size matters block presentation. Some of the Moda designers were given the challenge to create a block of varying sizes to show off their newest collections. 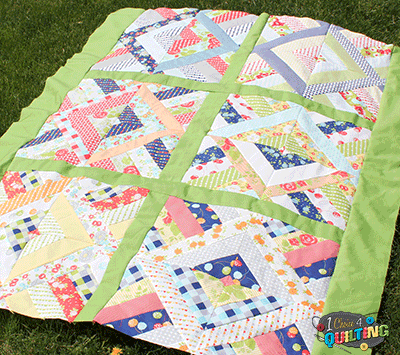 These free quilt block patterns will be available to you starting in June! 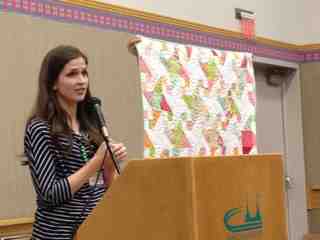 I was most impressed by, Laundry Basket Quilts designer, Edyta's passionate speech about how quilting comes from the heart and showed her newest collection called "Hope Chest." Next up was Bonnie from Bonnie and Camille. She showcased her upcoming collection called Scrumptious. Another beautiful collection filled with pleasing colors and designs. 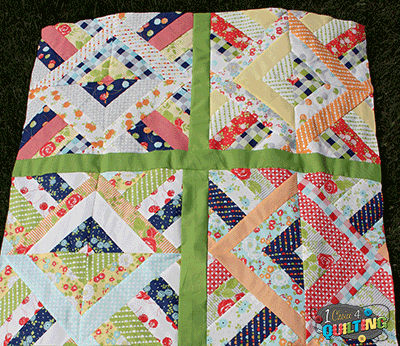 Another super fun line by Me & My Sister Designs called Giggles which was very reminiscent of the color schemes in Ticklish. It featured bold bright colors that matched their cheerful dispositions. 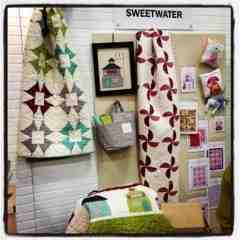 Next up was the lovely ladies from Sweetwater presenting their block using their new Road 15 collection. For this collection they asked for people to send them the street address of the home they grew up in and in true Sweetwater style designed a piece in this collection that listed those addresses, Road 15 being their own. 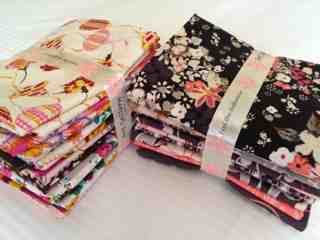 And last but not least there was the BasicGrey designers with their new fabric line Sweet Serenade! It was music for your eyes done in pretty shades of blues, creams, pinks and grays. I am sure this will turn into a project for my daughter's music teacher! My last stop for the day was at the Art Gallery Fabric release of Bari J and Jeni Baker. I absolutely love the quality and whimsical designs they presented. Bari J describes this line as that of a free-spirited woman who lives in the desert and loves to travel and collect beautiful things. I love how her fabric line tells a story. Want to see more? Watch a video featuring Bijoux by Bari J. I would love to hear what you think! off entire site through Tuesday at midnight! 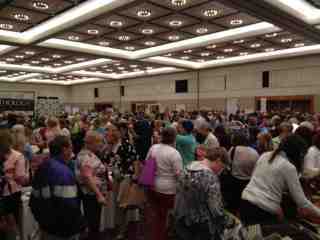 And secondly I am going to the International Quilt Market on Wednesday! I can not wait. I will be taking classes, talking to all of our favorite designers and taking lots of picture of beautiful quilts and more. Be sure to follow along here on the blog or facebook for daily updates! Okay so without further delay! Please read all the way to Step 22 as there are some variations with the backing so you can choose what works best for you. Now remember I told you to save the rest of your strips from your squares. Here is where they come in. Take the remainder of your 6 strips and make sure they are squared off. Mine were 13" square. Now cut them in half so you have two pieces. Mix up your strips....trust me it will be fun. Sew three of the strips together so you end up with a piano key designed strip. Repeat this step so you have two long strips. Take the remaining four strips and sew two of each together. Leaving you with two 24" strips. Since there are so many colors and designs in my Happy Go Lucky Jelly Roll, I choose to mix up my backing with two neutral Moda Bella Solids in American Blue 9900-174 and Gray 9900-83. I felt that this allowed my colors to really pop on the back. You can use two different coordinating fabrics or solids or one of the same. It is totally up to you. Cut your fabric to 24 1/2" x 45". You may need to vary this based on the size of your quilt top. Sew on the shorter of your strips from step 19 to the top of the fabric and the other onto the bottom so you end up with a piece that looks like this. Now originally I was going to do a straight piano key design around the back but.....no project of mine would be complete without some improvisation as I go along that ends up suiting my own personal style. I also thought I needed to break up the blue. Sew one strip to the bottom and one to the top. Strips on the bottom and top. Leave it this way if you wish! Or go to step 22. Hate it? No worries...you can use the piano key design if you wish, just be sure to cut your center piece 3/4" shorter to make up the difference in the extra seams. 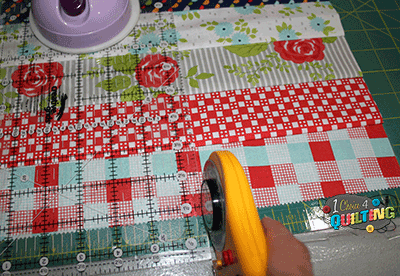 Take your center piece and sew on your side bars from step 18. Add your borders around the outside. And here is your finished backing! you have leftover fabric strips. Finished Backing should measure the same as the front. Mine is 66.5" x 46". I really love the new Happy Go Lucky Collection but unfortunately the yardage is not yet available so I used some Ruby Jitterbug Sherbert Yardage also by Bonnie and Camille that coordinated well with the prints and went well with gray in the backing. 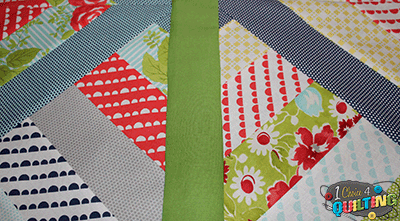 You can bind your quilt in whatever way you are most comfortable with. 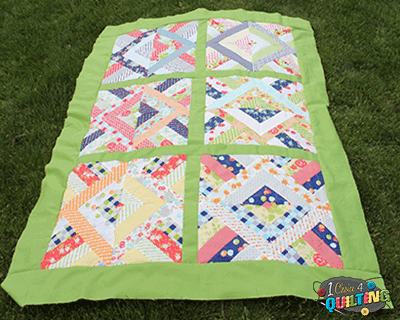 Can't wait until next week to give you a fun quilting technique! It's a Chevron Giveaway Day Winner and Happy Mother's Day sale!! 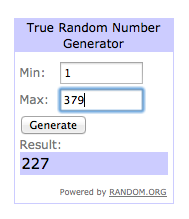 Thank you all so much for entering!! It was so fun to read all the comments and share in your love of chevrons! Our Happy Mother's Day sale is going on now through Tuesday at midnight! Save 20% on our entire site using "momsday20" at checkout! Cecilia has won from Riley Blake TWO Chevron 5" Stackers. Click here to see our entire Riley Blake Chevron collection on sale through Tuesday! Thanks to all who participated! We hope to hear from you again soon! 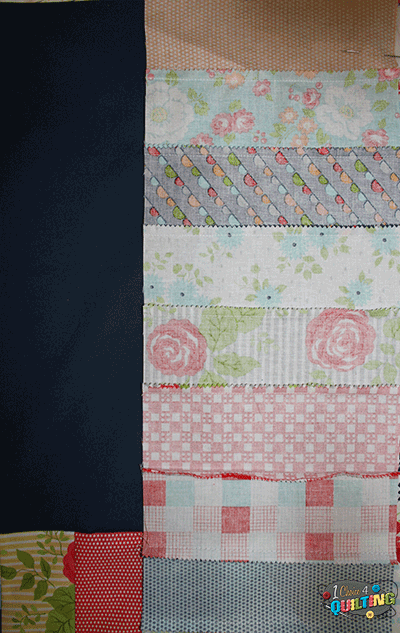 Please keep 1 Choice 4 Quilting in mind for future fabric needs. OKAY!!!! 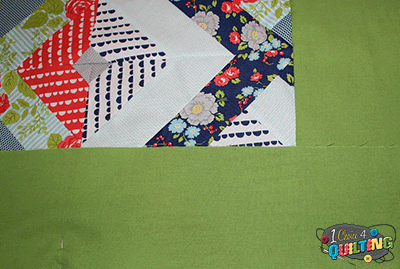 Here we go with week three of the Jelly Roll Mystery Quilt Along! 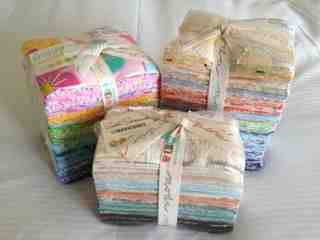 I think I am going to call mine the Kaleidoscope quilt. I decided to piece mine together with the four triangles meeting in the middle. I thought it was the best fit for my collection's colors and patterns. I choose to use Happy Go Lucky by Bonnie and Camille. The colors made me excited for spring which here on the east coast has finally sprung! 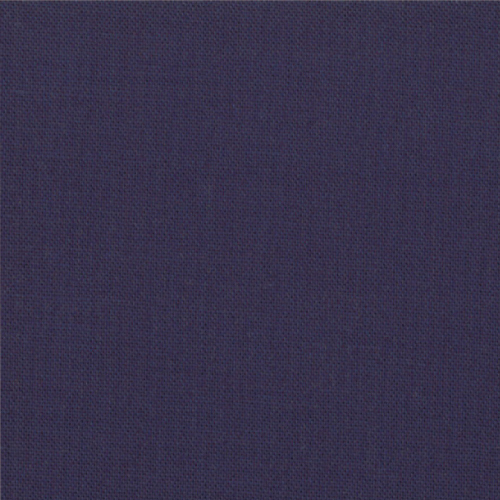 This is what your set will look like without the border. Here is what happened to me. I was all set to sew my strips all together and while taking photos in the bright sunshine on the green grass I was inspired to add Moda Fresh Grass yardage as my strips. If you didn't know Green in Pantone's color of the year and the green against my squares coordinated perfectly. If you choose to do the 2.5 inch stripping in between. Sew them with a 1/4" seam and iron flat. If you choose not to use the strips that is okay as well and you will just sew your squares together also using a 1/4" seam. Begin assembling your squares as you wish. 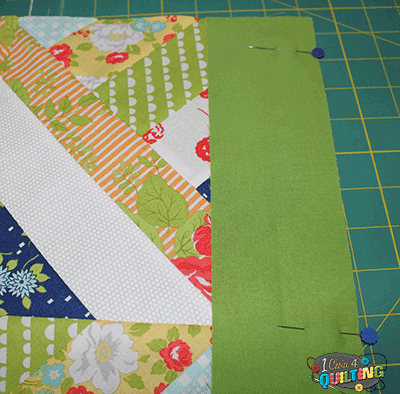 I put the green strip and then added the second square to the strip for each of the 3 set of blocks and then did the same vertically adding the strips to the 3 sets. 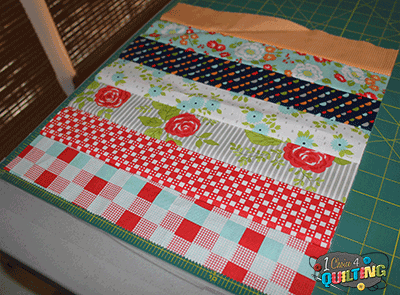 Once you have your strips sewn and your set all together it's time to sew the border. Again I choose to use the Kelly Green and my border strips were 5 inches in width and the length of my 3 sets plus the interior strips. Start with long edges first. Now add your top border. 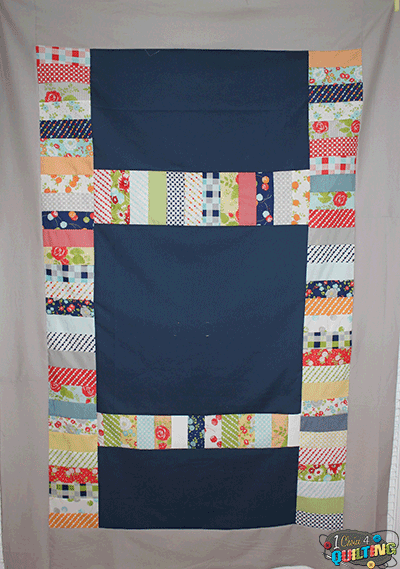 I also used a 5" strip here and again it was the width of my top which was 46" Wide. 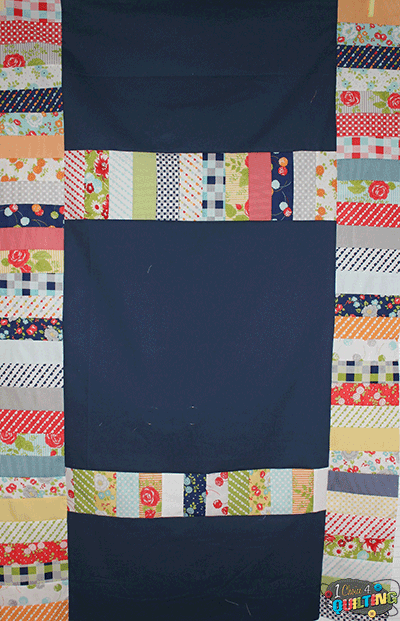 Add you bottom border, iron and check out your amazing quilt top. You can see below why I decided to call my a Kaleidoscope. It reminds me of seeing the little shapes in the center span out to create beautiful colors all around! My finished quilt top measures 66.5" L by 46" W. If yours varies, no problem. Everyone sews a little differently and it's okay to have some variations. If you have a questions regarding any measurements please let me know and I can help you. 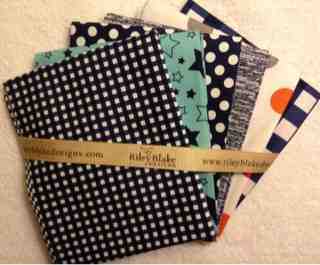 Don't forget to post your photos on the 1 Choice 4 Quilting Club Flickr Page for your chance at a Red, White and Blue FQB. There may even be some in there from the upcoming quilt market! PS... If you haven't already jump over to the Giveaway Link for your chance to win 2 Riley Blake Chevron 5" Stackers! !